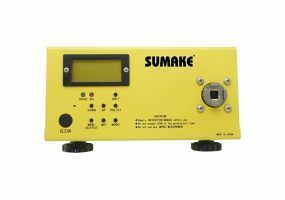 The Sumake TM-150A Digital Torque Meter is compact and easy to use and fully rechargeable for portal use. It can be used for measuring torque settings of Electric Screwdrivers, Torque Drivers and Pneumatic Screwdrivers. This Digital Torque Meter will measure in Kgf-cm/Nm/Lbf-in. The user can also set minimum and maximum test torque ranges and will be notified if the torque reading falls outside of the testing range. This Sumake Digital Torque Meter has a USB Connection which allows output to a computer. Comes supplied with Torque Calibration Certificate, AC Charger, Run Down Nut and Case.